This tour drives overland from Kathmandu to Lhasa across the Himalayas by way of the incredible Arniko Highway that connects Nepal with Tibet. Enjoy fabulous mountain scenery enroute, visit mystical Buddhist monasteries of Tashilungpo at Shigatse, the Kumbum Stupa at Gyantse, and drive past the beautiful Turquoise Lake. In Lhasa visit the famous Potala and Norbulinkha palaces, the great Drepung Monastery and walk through the bustling Barkor Bazaar before flying back to Kathmandu (or onward to China). 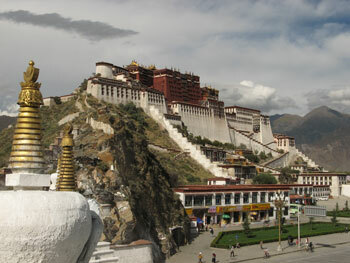 A choice of hotels is available in Lhasa and in other places. An unforgettable encounter with forbidden' Tibet. Day 04: Xigatse- Gyantse (3950m) 90km. Departure at 05.30 from Katmandu, after and approx. 6 hour's drive. We reach Kodari (Nepal-China Border). Further half hour drive by truck will bring us to Zhangmu, where after completion of immigration formalities check drive to Nyalam. Overnight. From Nyalam road follows the Bhotekoshi river in a deep valley with plenty of waterfalls. After 1-5 hrs. Drive brings us to Nylam Pass (3800m) with the Jugal Himal in view. A continued drive via Lalungla (5050m) will bring us in view of Mt. Langtang (7245m), Mt. Xixapangma (8013m) and Mt. Dorge Lakpa (6980m), Mt. Makalu (8464m) Mt. Everest (8848m), Mt. Lhotse (8516m), and Mt.Cho O Oyu (8201m). Overnight. Lhatze is 03hr away over a 5220m pass near the petrol station, there is a small restaurant where tea snacks available. Depending upon the road conditions, Shakya Monastery, which is 26 km. Off from the main road will be visited. Shakya is one of he oldest and most important monastery. Reach Xigatse, the place of the famous Tashilumpo Monastry the seat of Panchen Lama his death in 1989 with its huge thanka Wall cleary visible on north side of the road. Overnight. Day 04 Xigatse- Gyantse (3950m) 90km. After visiting Tashilunpo Monastery in the morning including the bazaar of Xigatse, drive to Gyantse, which is 02 hr. this is small bustling town, steeped in the history. It lies 264km south west of Lhasa on the northern bank of Nyalun Chu River. In the 15th century it served as the capital of the small kingdom. Visit Kumbun Chorten and Phaklakor Monastery, which was, built around 1400 ad it later, became the main Centre for trade with British India. Overnight. 08-hr drive takes you to Lhasa crossing the Karola Pass (4794m). The Karola climbs between two lofty mountains, Nozing Khangsa (7223m) and Ralung (6236m) while driving you will see the Yamdrok Tso (Turquoise Lake) which takes approx. 1 hour to cross around. After passing Kampala, Lhasa Valley is seen to the north. You will also cross the Brahmaputra River. Reaching Lhasa and check in hotel. The accompanied guide will reconfirm your onward airline ticket. Overnight . These days you will be engrossed with sightseeing and excursions of the Potala Place, The Jokhang Temple surrounding Barkhor market Drepung Monastery and Sera Monastery. Overnight. Transfer to airport 02hr.drive Representative will assist you. Departure of flight to Katmandu would be approx 10.00 hour. China Standard Time and arriving Katmandu at 09hr.